I had purchased some frozen strawberries a while ago. I had intentions of using them for something (right now that something has escaped me), but I never used them. So I have been trying to find something interesting to use them in. Maybe it is spring fever, but I decided to try some Italian ice. Normally I would have left this recipe to post for the summer months… but my spring fever urges won out. This is a simple recipe and the end result is fantastic. 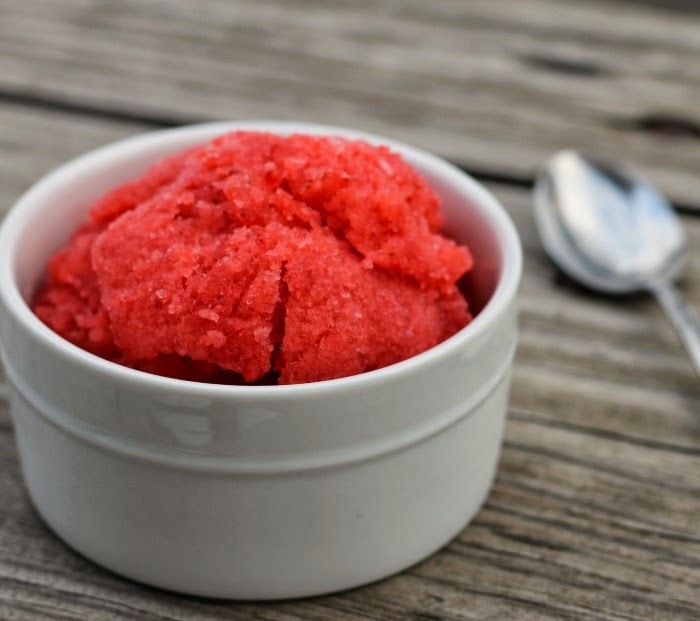 I looked at a lot of recipes for frozen treats with strawberries and this one was the most interesting. 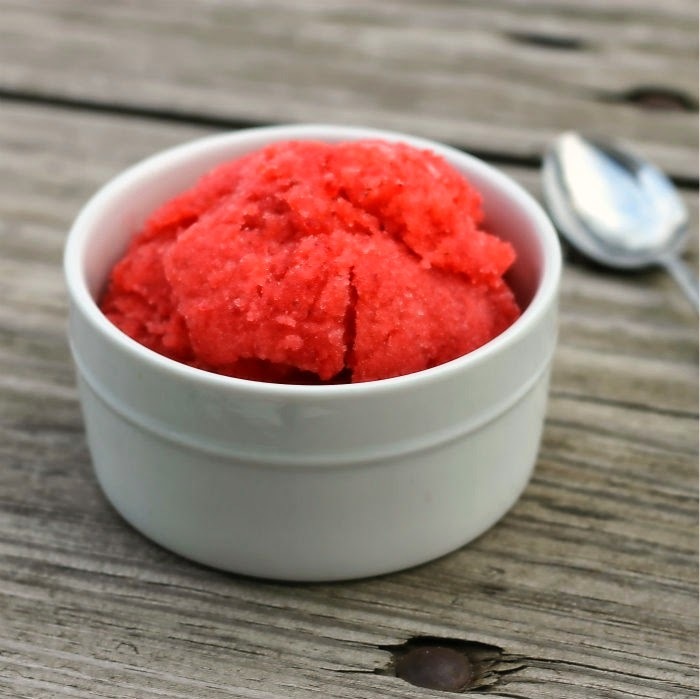 It not only has strawberries but it has a hint of citrus, which adds to flavor of this Italian ice. 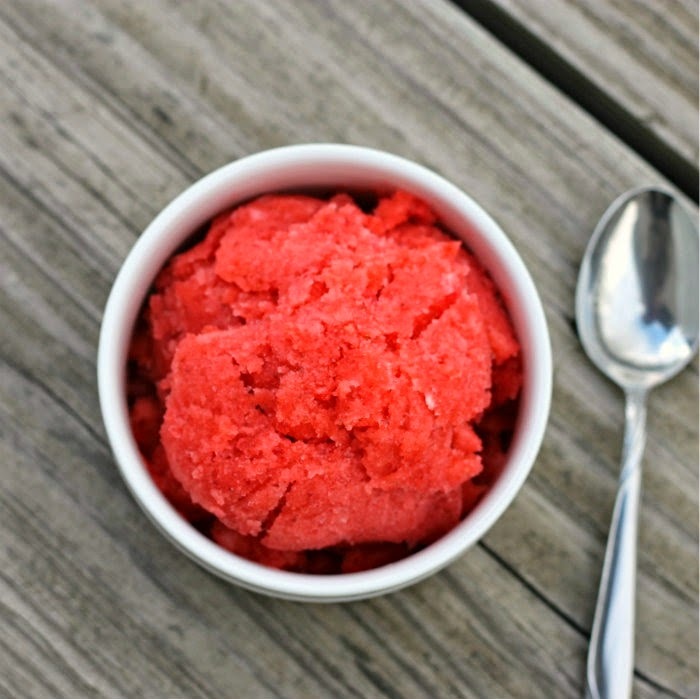 I can’t wait to try other flavors for this Italian ice… I know that this will be a summer favorite at our house this year and summers to come. 1. Slice the peel off the orange, lemon, and lime making sure not to cut into the fruit and place in a medium sauce pan. Add the water and sugar to the peel and bring to a boil, uncovered. Reduce heat and simmer for 5 minutes. Strain and discard the peels. Stir in the orange, lemon, and lime juices. 2. In a blender combine the frozen strawberries and the juice mixture. Cover and using the ice crush mode pulse until nearly smooth, leaving some small chunks of strawberries. 3. Cover and freeze overnight, stirring once after freezing for about 2 or 3 hours. 4. To serve, scrape across frozen mixture with a large spoon and place into individual serving bowls. I LOVE Italian ice! Especially fun flavors, like strawberry, which you don’t come across very often! Never would have thought that I could actually make my own Italian Ice. This is a “must” for my summer.